HP has filed trademark patents for the names TouchPadFlex, TouchPadPro, TouchPadTwin, TouchPadGeo, TouchPad7, and TouchPadGo, most likely for the future iterations of its webOS tablet line. We are especially curious what idea lies behind the TouchPadFlex. 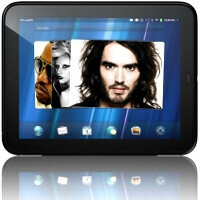 The HP TouchPad tablet can be preordered starting June 19th, and should be shipping July 1st, at $499 for the 16GB model. HP released a bunch of videos promoting various features of the webOS slate. A 3G version should be available later this summer on AT&T. The mothership HP is also launching a huge marketing campaign to backup its webOS products, booking names like Jay-Z, Lady Gaga and Kanye West for the festivities. The giant computer manufacturer is a bit late to the tablet party, so it is obviously not sparing any efforts to fuse quality hardware and software, and get the word out. The six trademark names in the TouchPad line it filed for also mean that it could very well be hard at work for the next generations of its webOS slates. I cannot wait for this beauty!